This heavy-duty, compartmentalized Tool Tray easily attaches to all FEEDBACK Sports Repair Stands. Contains a basin with drain plug for washing parts. Also has a coffee cup holder and rag hook. Very happy with this. It is much more useful than the tray for Park Work Stands. All of the typical tools, like hex wrenches, fit and store nicely. I've owned both Park and Feedback stands and because of this tray, I like the Feedback stand more. 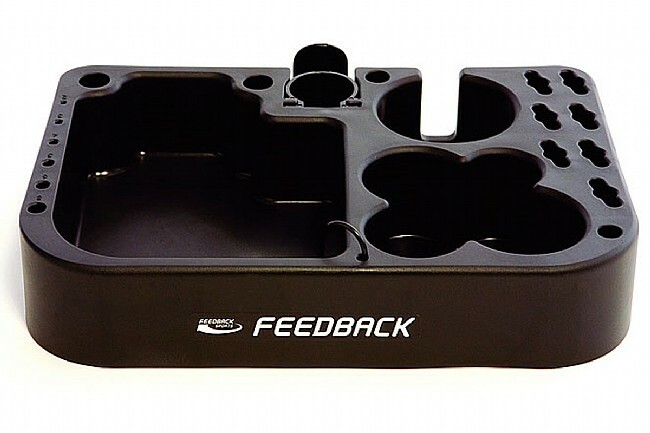 I'm using this tray with the Feedback Pro Elite repair stand. It mounts securely without any tools or hardware. Assorted slots help to organize allen keys, and other tools. It comes in really handy for keeping small parts within reach. It needs to be positioned high enough so that it doesn't get hit by the pedals if you are rotating the cranks. That is easily accomplished by sliding the tray up andor rotating it. The Feedback stand folds easily, but this must be removed every time. It's not as easily attacheddetached as it could be. Lightweight, easy to attach and has nice storage compartments. Glad I got it!